Baby Robots - "Lakitu: The Baby Robot"
Baby Robots is primarily the work of Florida guitarist Bobby Baker, along with numerous guest musicians (including, apparently, some members of ST-37). Baker’s music is an eccentric blend of alt-rock, shoegazer, and psychedelia. Take the melodic fuzzpop of Lessons or the Syd Barrett-like rock of Privacy Calls. Listen to the excellent, bluesy I Can’t Stand Me, or the freaky, spaced out overdrive of Leave Me a Note. Then there’s the hazy, blissed-out noise of the My Bloody Valentine-like Outgrow All Things. Stacking it up, Lakitu: The Baby Robot is a quirky but enjoyable indy blast. And while it’s all quite noisy, the noise never overwhelms. The album remains very laidback and amiable. Slacker melodies from both guitar and vocals creep around in the mix, emerging through the haze of feedback, as do some fine moments of psychedelic guitar histrionics (most notably on the aforementioned I Can’t Stand Me). There are a few surprises too. 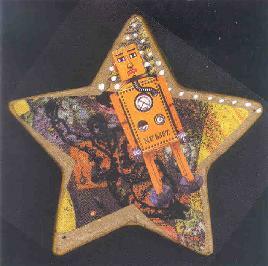 The clunky, psychedelic space instrumental of Sailor the Puppet, that oozes early Floyd, and the minimalist, industrial robot dance of All Good Stories. Just enough to throw the listener for a loop by keeping things unpredictable. On the Baby Robots web site, it looks as if Baker has relocated himself from Florida to Texas, and has put a more stable band line up together. It also seems the Robots are going to go all instrumental for their next excursion. Should be interesting! For more info, visit the Baby Robots web site at: http://www.babyrobots.net.